Presentations are a critical communication medium entrepreneurs need to be adept at. Good presentation techniques make it easier to get your point across to your team, investors and customers. However, to be able to present like Steve Jobs, requires a lot of hard work, creativity and passion. Without these three components, not only will your presentations suffer, lack of these qualities impact the overall quality of life. We have all been at presentations where we have seriously wanted to shoot the presenter, unfortunately sometimes this may have been us. I have a personal example when I was presenting the constitution of our entrepreneurship society to a new chapter we were inaugurating in China. I am pretty sure that within 5 minutes I had everyone in the room asleep. Looking back at that experience, I blamed the material, however, it really was my fault for not putting the material across in a manner that would have engaged the audience more. As entrepreneurs most of the time our presentations will revolve around pitching to investors, introducing a new product/service to a customer, or giving a quarterly sales report to the rest of our team. Most of these presentations have huge amounts of data that needs to be presented in graph forms, charts and numbers. What often happens is we tend to get lost in the detail and forget the overall message we want to leave the audience with. Other times, we just read off the slide, word for word, and that can be a most painful experience for the audience. The worst case scenario is when the presenter is visibly unenthusiastic about what he/she is presenting. Unfortunately, many of us fall into these common pitfalls and that can have a detrimental impact on our ability to convince a team, get funding or close a sale. Over the course of the coming week I will talk about some key elements your presentation should comprise of. These should provide your presentations with that extra level of oomph which should excite, motivate or inspire your audience, whichever of these is your objective. However, to begin the process, we first have to break away from traditional “rules” we follow regarding how a presentation is supposed to be structured. We have to begin thinking creatively, with two objectives in mind, these are, what is the audience expecting of us and, what message do we want to leave them with. I hope this series will be of some help, I wish you all the very best in your future presentations. The brand creation process is a long one, it requires perseverance, consistency and an underlying emotional connection with the target segment. Its aim is to instill a level of brand loyalty in its customers, which will in turn generate exponentially increasing recurring streams of income. This process needs to be thought through thoroughly from the very beginning of developing a business model. It is far more challenging to change the perception of your product/service in the mind of your customer once it is established. Therefore, focus on first impressions and how to position your product/service from the onset. Listed below are 5 steps to help you get started in the brand creation process. I believe these are vital foundational steps. The development of a brand is however not limited to these steps alone, and I will discuss advanced branding concepts in later posts. 1. 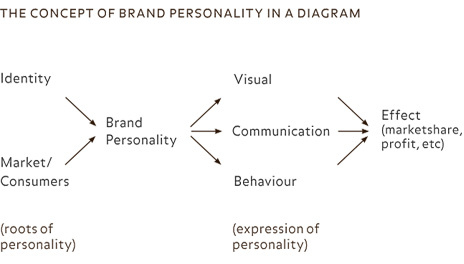 Brand Personality: A brand personality consists of two important components. The first being a thorough understanding of what your business is, and what it stands for. These can be goals, objectives and core strengths. The second component is understanding your target segment. One should be completely aware of their needs, pain points, competition and goals. When these two components are brought together a better understanding emerges of how to get across to customers and stakeholders. To learn more about creating a brand personality please click here. 2. Competitive Edge: Why should a customer pick your product/service over a competitor’s? Your brand needs to communicate its competitive edge clearly to help develop a connection with the target audience. Use your competitive edge as an integral part of brand development and positioning strategy to enable you to not only build a worthwhile brand, but also a strong business model. To learn more about integrating your competitive edge into the brand development process please click here. 3. Positioning: Every customer classifies a business or brand internally. This internal wiring is the definitive feeling at the interaction point with your product/service. The last thing you want as a start-up organization is to be known as “Oh you do the same thing as say… Facebook”. Much thought needs to be put into how you want the customer to perceive your brand. How is it distinctive, what are the common associations with your business model and how can you use them to your advantage? To learn more about positioning your brand correctly please click here. 4. Selecting a Name: Once you have a good understanding of the steps mentioned above, sit down and brainstorm possible names for your business. I find it useful to follow basic guidelines of keeping them simple, avoid generic terms, the name should be easy to pronounce and spell and, should be unique. Apart from that, formulate a list of questions highlighting word associations, emotional associations and other factors which help formulate a right name. After this process, shortlist and get feedback from friends, family or even stake holders. Take your time with this step, do not force a name just because you cannot think of anything else. This is something you are going to have to live with for a long time. To learn more about selecting a name please click here. 5. Key Brand Elements: The devil is always in the details. The final step in the process focuses our attention to key brand elements which include, logos and word marks, tag-lines, colors and typography selection. These elements need to reflect your brand personality and positioning. These factors are integral for instigating a connection with your target customer. It also helps to establish consistency in how we communicate with our customers and stakeholders at every touch point. Without this consistency we will not be able to establish a level of trust which results in brand loyalty. To learn more about different key brand elements please click here. As you can see, the brand development process is a lot more than selecting a name and creating a logo or word-mark. It requires us to think deeply about the business we are establishing, the message we want to communicate and how we want to communicate it. There needs to be a story behind your brand and what it stands for. When you look at world class brands today, each one of them means something different to each and everyone one of us. Why are some individuals fanatical about drinking Coke and not Pepsi or selecting a PC compared to a Mac? When did the brand become more than a symbol, to being an integral part of who we are? I hope we all get the opportunity to create such a brand one day. Best of luck! This is a very well developed presentation on branding. I hope you all enjoy it. If you think coming up with the next million dollar is challenging, correct selection for the name of your business is not going to be any easier. A name formulates the foundational base of your entire business. It communicates what you do to your target segment, what differentiates you from the competition and is ideally meant to instigate curiosity to find out more. A logical argument often used against this methodology of thinking, is that names such as Google, Amazon and Monster do very little to reflect what they do, yet, they have become mega brand names. The fact of the matter is, the businesses mentioned above were pioneering companies which revolutionized internet search, online shopping and online recruiting. They are built on very sound business models and due to the sheer superiority of their products/services they have become household names today. Getting the name game right is something I have been giving more time towards, in my more recent ventures. We named our first design agency “Synaptic Creations”. I am not a biology student but picked up the word from a friend who told me synapses were the gap between two neurons, over which impulses lead to learning. It made sense at the time and we went with it. The word creations however, is too generic and reduced the ability for us to expand into other areas as well. It also confused some individuals who thought we may be some genetic based start-up. The name would fail several of the benchmarks I now have, for appropriate names for a business. It is important is to learn from mistakes made in the past to help you get it right the next time. Most of the time, start-ups have to select their own name unless you have managed to secure some major early stage funding. If you have I would recommend NameLab or similar brand name consultants. If you are on your own, there are basic guidelines, namely, keep it short, keep it simple, avoid generic terms, the name should be easy to pronounce and spell and, should be unique. I do advocate a structured process to help you think in a more focused manner, which will in turn help you in deciding on a name which has been looked at from all angles, and has had major thought put into it. 1. What would be the word you would want customers to associate your business with? 2. Who are you target customers? 3. What are the unique components of your business model? 4. How are you different from your competition? 5. What words best describe what your business does? 6. What emotions do you want your name to instigate in the customer? Develop similar questions based on your business concept, and come up with as many permutations as possible by mixing and matching. Create a filtered list of names which passes the basic guidelines. If possible do a focus group or collect feedback from friends and family on the names you have shortlisted. This process will take a lot of time, so plan in advance for it so that there is no need to make a rushed selection. This is a name you are going to have to live with for a long time, you need to make it count! When you walk into a supermarket with the intention of buying eggs, do you actually pay attention to the branding on the eggs or do you pick up whatever is available? I usually pick up whatever I find. However the decision is more complicated when I want to get a soft drink. Brands such as Coke and Pepsi have spent billions of dollars positioning their products as the only cola alternatives. A frame of reference has been created and no matter how many new rival products are introduced in this category, it is almost impossible to dislodge the current leaders. 7-Up did something very interesting with its positioning when it rebranded itself as the “Un-Cola”. Since it could not use the word cola in the customers mind, it reframed it’s positioning relative to its competition and took up a unique position in the minds of customers. Naturally having the edge of being first in a certain category, has it’s advantages. However, competing in markets where there is already some competition, we need to figure out a way to convince potential customers, to use our product/service instead. This requires a lot of creativity and understanding for your target market and your competitors offering. As mentioned in prior posts, we have to take into account the sort of persona we want to project and what competitive edges we want to bring to the forefront. Take for example the rent-a-car business in America. Hertz had a large edge over the No.2 provider Avis. That was until Avis capitalized on its position by using the tag line “Avis is only No.2 in rent-a-cars, so why go with us? We try harder.” This statement dramatically helped the profitability of the company and more importantly helped customers develop a reference point between Avis and Hertz. As a start-up organization we often cannot afford to pay tens of thousands to brand consultants to help us develop positioning strategies. However all is not lost. The end goal is to own a word in the mind of the customer, or be able to communicate your business concept in 5 words or less. Much effort needs to be put into name selection and the use of words as discussed in the brand personality post. These will be discussed in greater detail in the next post in the series. A well positioned brand will lie at the intersection of all four requirements. If you had to describe the Apple brand in terms of a celebrity who would choose? Could you use the same celebrity to represent Microsoft? Most likely, not possible. I find this thought extremely interesting as it sets out to externalize the internal emotions and perceptions we have for certain brands. We all know that Apple and Microsoft products are very different, however, each one of us has a unique way of perceiving these brands. As a business owner, we have to be in tune constantly with the way our business or brand is perceived by our customers. Is it being perceived the way we want it to? Are we consistent in our branding strategies across all customer touch points? Inability to do so will create a negative perception of your brand in the customer’s minds. 1. Identity: One has to be absolutely clear about the aims of your organization. This includes goals, objectives, and strategic plans which have been developed for your business. Focus on core strengths and identify areas where you have a competitive advantages. If your business concept is unfocused, abstract or too diverse, these same factors will manifest themselves when communicating with target customers. 2. Customers: The second point which needs to be clearly defined is, identifying customers and their specific needs and requirements. One needs to understand their pain points, ambitions, worries and goals. This has to be done through qualitative analysis, by actually talking with your potential customer face to face. Once this is completed and assessed, we will know how to position our brand from their point of view. It is only after we have successfully clarified these two components, can we actually start the process of developing a type of personality for our brand. We will be able to address key issues on what our brand voice should be, what characteristics our customers are looking for, and visual design to stimulate interest. I quote Tom Dorresteijin who sums up importance of a brand personality very well “We use brand personality to bring brand strategy to life.” By developing a strong personality with solid foundations we can now move to the next steps in developing our brand.